Make your own unique outfit with these amazing victorian costume sewing patterns. These suppliers vary from authentic and historically accurate patterns to more theatrical and steampunk costume designs. Of course the real joy of making your own outfit is not only having your own choice of fabrics and trims but the freedom to alter patterns to create a different design if you have the skills. Have you got a project on the go and need support? Or maybe you just want to show off your fabulous wardrobe. Join our Facebook group to do both! These links provide The Costume Rag with a small commission on sales at no extra cost to you. Don’t want to wait for a pattern to be shipped from another country? That’s no problem when Wearing History provides PDF patterns you can print at home. Some of the designs are taken from original victorian sewing patterns that have been digitally optimised with sizing options the originals didn’t provide. 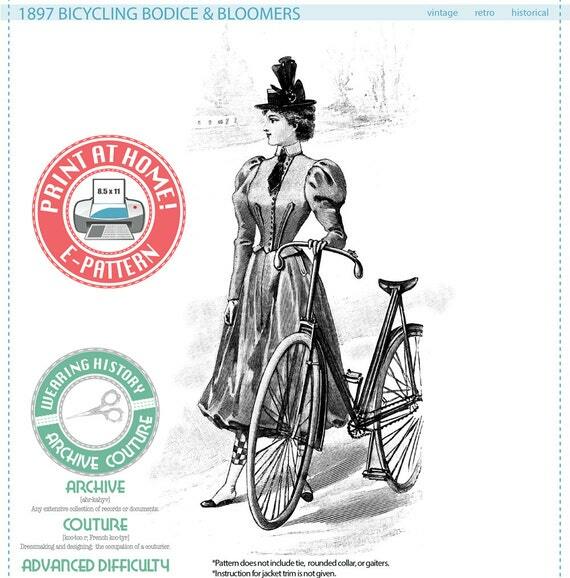 This incredible 1890s cycling outfit comes with the original pattern description translated from French to English, helpful tips for construction and fitting including how antique patterns differ from modern ones – Dangerous Liaisons‘ costume designer Gwen Russell emphasised this consideration in her interview. The original fit has been preserved so you can alter to your modern form at the mock-up toile stage. Period instructions for sewing a pointed placket are provided. 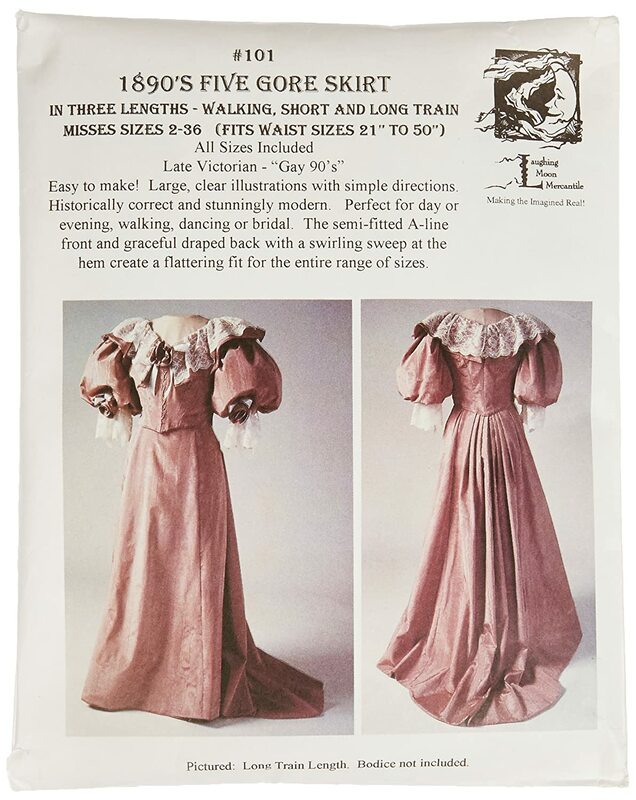 Nevertheless with no step-by-step instructions Wearing History warns that its ‘Archive Couture’ line of patterns including this example are made more as detailed sewing exercizes rather than easy projects. Truly Victorian sewing patterns are made to fit the modern body using historical principles and techniques. All the seam lines and styles are historically accurate to each period. The designs available are the basic shapes required to make period clothing with the details of trimmings left off for you to customise as you see fit. The result is a garment that the average person can learn to sew that actually fits the modern body and provides a blank canvas for further embellishment. Each pattern is printed on white bond paper, with all the sizes included in each package. Skirts and overskirts come in 7 sizes, XS-3XL, and bodices come in 14 sizes, A-N. Interestingly Truly Victorian do not use standard modern sizing as it has found it doesn’t work well with historical clothing. 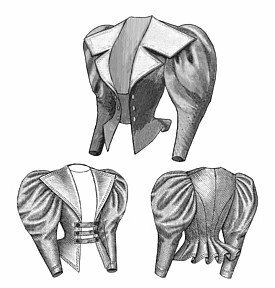 While full instructions on how to fit and sew each garment are given with some illustrations these victorian sewing patterns still require basic sewing knowledge. 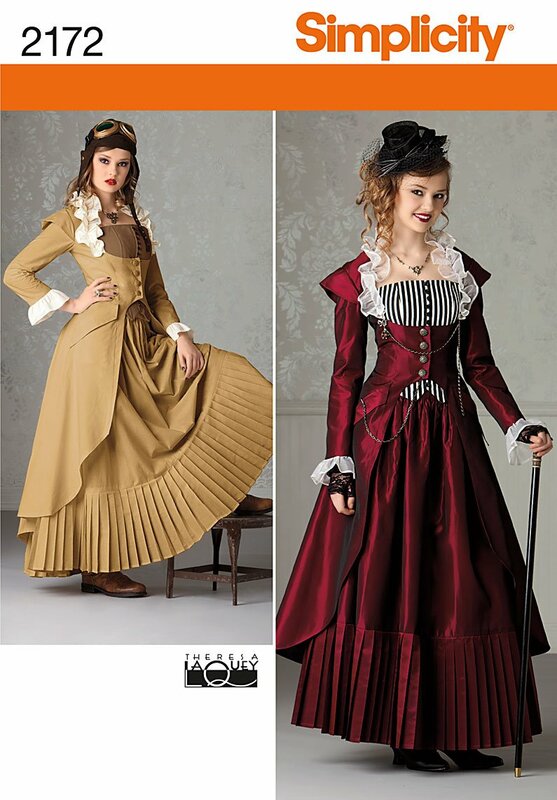 This massive sewing patterns brand does have a historical branch of Victorian costume patterns. 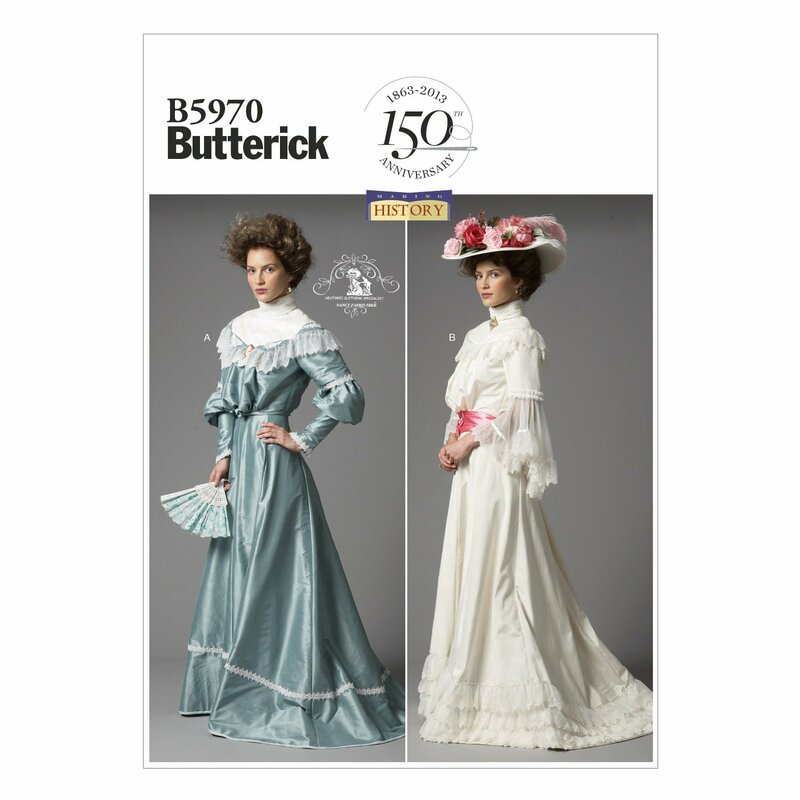 Better yet, despite being a big brand with a low-cost sewing pattern this more Edwardian design from Butterick is more authentic than many on the more mainstream market as the full dress is supplied in its components of blouse and skirt – no zips needed. This little brand specialises in Victorian garments with a Wild West inclination, although they also go back to 18th century patterns. The designs are taken from extant originals and tirelessly researched. According to Laughing Moon this 1890s skirt is historically-accurate as well as flattering and easy to make. It has seams at side front, side back, and center back and pleated back panels. The back opening can be made with a period placket or modern zipper. The lining is sewn to the skirt in the flat-lined method and the hems are faced. The skirt has a waistband and a single optional pocket. There are three length options, walking, short and long train. Simplicity Pattern Co Inc was founded in New York City in 1927. Most costume fanatics will associate this global brand with its collaboration with American Duchess on 18th Century sewing patterns which includes the spectacular Outlander inspired dress. 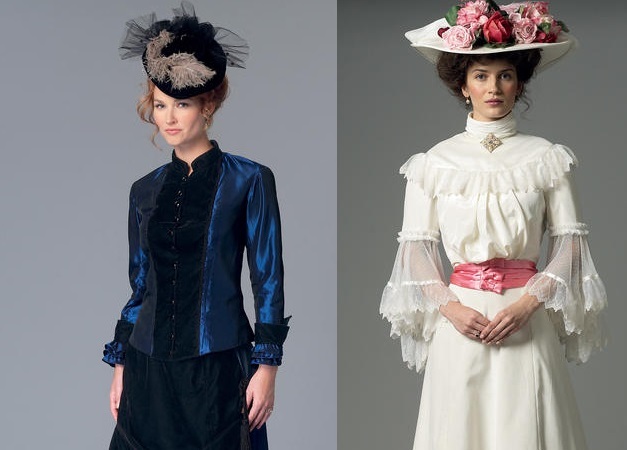 However you can still find some great Victorian patterns perfect for more theatrical settings like Simplicity 2172. They also do a range of Steampunk costume patterns. Don’t forget that big and long-established brands like Simplicity often have extensive back catalogues of out-of-print Victorian sewing patterns you can still find on Etsy.